Although many kids are back in school, some of you may still have kids at home this week. If so, you might (like me) be running out of inexpensive, local activities to keep the kids entertained during these hot late-August days. A great way to cool off and inspire your kids’ creative side is to check out the Sawdust Festival in Laguna Beach. The Sawdust Art Festival is a tradition each summer, and it ends this Sunday. It’s not only a great activity to do with the kids, it supports local artists in Orange County. The Sawdust Art Festival is a non-profit group educating the public and promoting the art created in Laguna Beach. It’s open daily from 10-10. Admission tickets are $7.75 for adults, $3.25 for kids 6-12 and free for kids under 5. There are also discounts for seniors, free admission for members of the military and their families, and resident nights with free admission for local residents after 5:00pm. For more information on ticket prices and discounts, click here. There is plenty to entertain the kids, including a kids art center, reserved just for young artists to make their own creations – at no charge. There are also free live art demonstrations and art workshops (additional fee for workshops). My kids love watching the glass blower – it’s one of the highlights every year. 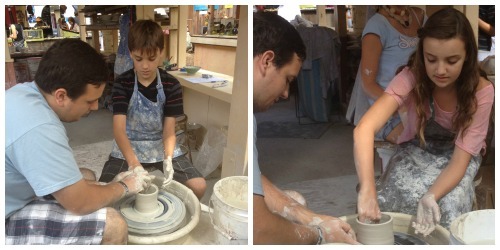 This year, for the first time, my kids also tried the “throw-down experience” where they got to create their own pottery on the potter’s wheel – with some guidance from experts to help them. For just $8, you can have their creation fired and painted, ready to pick up a few weeks after your visit. With over 200 local artists with their work on display, live entertainment , tasty food and a beer garden, there is plenty of fun for adults too. Parking at the Festival is $10 but there is also metered parking along Laguna Canyon Road. With many back in school, this is a great week to go and avoid the crowds. The fun ends this Sunday, when the Sawdust Festival grounds close up until the annual Winter Fantasy, beginning November 17th. Posted in Seasonal and tagged art, kids activities, Laguna Beach, Orange County, Sawdust Festival. Bookmark the permalink.